Can you remember what things asked by the Enterprise company, and what are own idea of IS team? In the beginning there would have been a contract between the backers of Elan/Enterprise and IS but (unfortunately) I don't know what that said - I would guess it was probably in fairly vague terms as we had quite a lot of flexibility in how we implemented features, and it probably concentrated more on hw (max colours, max memory, build-in joystick etc). With EXOS particularly I don't think there was any specification document before hand - we were just free to implement it in the best way we saw fit. BASIC was a bit more constrained because it was ANSI standard (that's where the BCD arithmetic spec comes from) but I have never known who drove that - Enterprise Computers or IS management. EXOS's channel-based design though was heavily influenced by ANSI BASIC's requirements. I'm pretty sure that initial contract did not include things like FORTH (& LISP). When they gave me the go-ahead to turn FORTH into a proper product I guess IS went to Enterprise Computers and negotiated a separate contract (and payment, which never happened!). The Entersoft Address given there, 37 Bedford Square, London, was IS's address! Furthermore the name, Keith Elliot, is vaguely familiar to me but in my mind I cannot put a face to the name. It is dated 16-22 May 1985 so 1 year before the collapse. There was one programmer working on Educational software which might have been for the Enterprise but equally might have been for something else. I am certain there were no Entersoft programmers there! The demonstration programs which are shipped with the computer and another in-store-demostration for the shops, are written by IS? Yes it may well have that one but I'm not 100% certain - I did not pay very much attention to what he was writing but the first screen shot looks very vaguely familiar. He was considerably older than the rest of us and did not really mix with us or our way of working. I cannot remember his name. I'm not sure about the demo programs - some of them look like they are developments of test programs we wrote so were probably written by IS but others, such as the interlace demos, I had not seen before. I'm not sure about the store demo either - again I do not remember seeing that before. Question from the Hungarian forum: what are feel the developer team when clear the Enterprise is unsuccesful in the UK market and finally when the companies collapsed? I don't think it was clear to us that the Enterprise was not successful until the collapse - it was very sudden. Bedford Square in London, where IS's offices were, is near Tottenham Court Road, which is the electronics centre of London - the street was lined with many shop selling hifi, computers etc. So we would walk to work at IS passing shops with the Enterprise in the Window - it was not clear to us that it was not doing well. It was of course a shock and sad, it was the end of an era, but the end of one era is the beginning of another, and it was an exciting time starting afresh at Madge Networks. I don't think I looked back much - too busy looking forwards! And I was still working on the TVC, so all the code we had written was not going to waste. We were pretty insulated from the fallout of Enterprise Computers. I suspect my colleagues working on the chess side of IS did not do so well, but we never heard from any of them again. It was a bit of a worrying and difficult time for me personally too: just a few weeks earlier I had just taken out a loan, which I could hardly afford, to buy a house, and the possibility of finding myself out of work was very real! Robert Madge's mother's disused farm where we started out at Madge Networks was a 2 hour train and 1/2 hour walk from my new house, so I had to spend 5 hours a day travelling. I did that for a year before I could finally afford to buy a car, which cut my journey to 1 hour each way. As I recall my overriding feeling at the time was just relief that I still had a way to pay my new house loan! I don't think it was clear to us that the Enterprise was not successful until the collapse - it was very sudden. Is not share the Enterprise company any sales statistic with the IS? 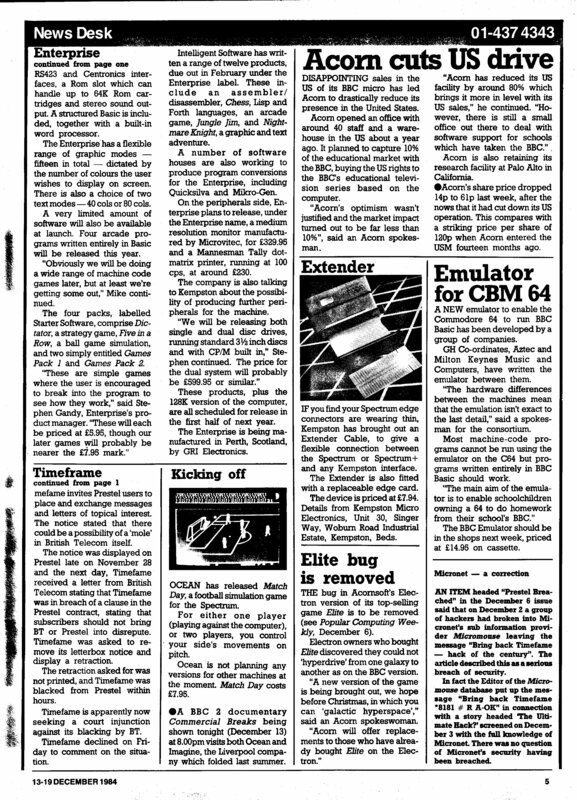 In this time (85-86) the Enterprise Computers not asked IS for developing games and other more softwares? As far as I am aware IS was not approached by Enterprise Computers to develop games etc but I do not really know what went on behind the scenes. The delays did not help either - developers would need an Enterprise for a few months at least to develop a new title. As you say...catch 22! and as a private company they did not have any obligation to publish them. And it remains a secret how many Enterprises were sold in UK! 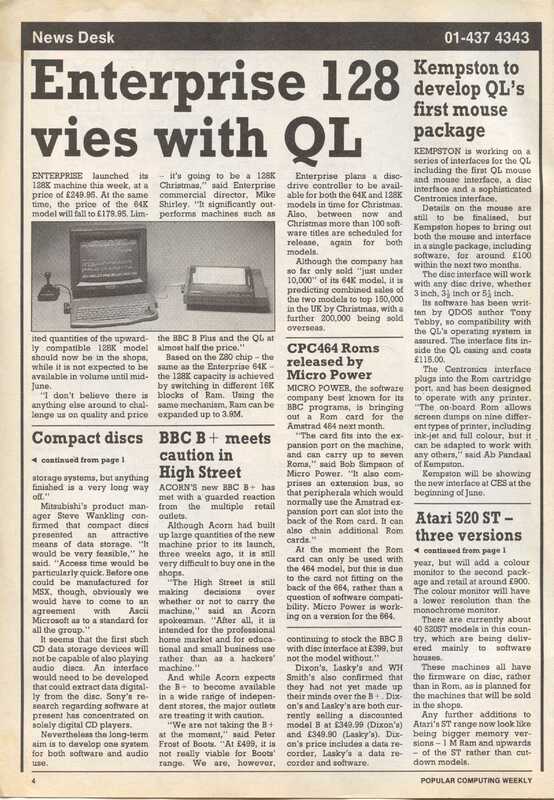 About the EXDOS and IS-DOS: this article (from 1984 December) told "CP/M built in". Originally one DOS planned? And later divided into two parts? The IS-DOS planned originally to ROM and later remained on disk? I think there is a lot of speculation and mis-information in that article! As far as I remember there was never a plan to run "real" CP/M - only a compatible system, and I don't think IS ever wrote games other than chess and the one case I mentioned before, but it is possible some discussions took place that I did not know about. I think IS-DOS was always planned to be disk-based (like CP/M, MSX-DOS and MS-DOS) - if anything, the idea of a ROM-based EXDOS, using : commands, only came about when we started development. I don't think we ever envisaged IS-DOS being ROM-based. Probably the article writer mixed the Intelligent Software (Forth, Lisp, Cyrus) and Entersoft (games) informations?